For total peace of mind and the cleanest pool you have ever had. Call Pools and Spas Service Inc. today for information on the Pentair Bioshield Ultra Violet Steralizer. Pool water can be a breeding ground for several kinds of harmful bacteria and pathogens that can cause Recreation Water Illnesses (RWIs). That’s why PentairPentair has harnessed the power of UV light to neutralize bacteria and prevent its reproduction. The BioShield® UV SterilizerBioShield® UV Sterilizer provides instant protection as it “zaps” those harmful waterborne pathogens, providing cleaner, safer pool water for friends and family. 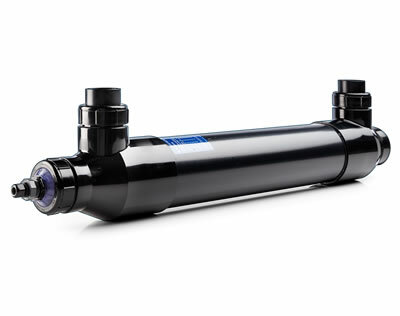 The Trade Grade Bioshield UV Disinfection Sanitizer harnesses the instant neutralizing power of Ultraviolet Light to virtually eliminate all unhealthy microorganisms in your pool in a matter of seconds. Bioshield reduces chlorine usage by 50% while zapping harmful waterborne pathogens, providing cleaner, safer pool water for friends and family. When used with a salt chlorine generator an added benefit is elongating the life of the cell due to the reduction in chlorine usage. Neutralizes 99.9% of harmful bacteria and pathogens quickly. Reduces chlorine usage by up to 50% to eliminate itchy skin, burning red eyes and chemical odors. Extend the life of Salt Chlorine Generators. Neutralizes Cryptosporidium, Giardia, and E.Coli.